How much does it cost to travel to Novalja? How much money will you need in Novalja? Additional pricing is in the table below. These average travel prices have been collected from other travelers to help you plan your own travel budget. Novalja is a Croatian town in the north of the island of Pag in the Adriatic Sea. Novalja is known internationally as party central because of the infamous party beach, Zrce, which boasts 4 clubs open around the clock. The pumping house/techno music and dance parties typically start at around 4 pm and continue well past 2 in the morning. During the summer, many well-known DJs and groups from around the world, including Benni Benassi, Jamie Jones, and Swanky Tunes, host concerts in these nightclubs. Zrce is not just for party-goers though. Many families lay out their towels for a day at the beautiful stone beach. This Novalja beach has cafe-bars and restaurants so you can easily grab a bite to eat or quick drink at your convenience. In addition to Zrce, Novalja offers tourists a number of other gorgeous beaches. Cista and Babe and both are perfect if you're looking for a calmer location. Both of these beaches have a lot less activity than Zrce, making for a relaxing afternoon, and their waters tend to be a bit warmer too. The Roman aqueduct was manually chiseled out in solid rock and is 1042 m long, about 60 cm wide, and its height varies. The aqueduct provided locals with drinkable water. For many centuries it was unused and was rediscovered in the 19th century. At the beginning of the 20th century it was again used for three short periods. Nowadays the aqueduct can be visited in some places and local authorities constantly work on its further revitalization. Beach Rucica in the village Metajna It gives a feeling of being in a canyon, and it has crystal clear water and pristine sand. You can also visit Novalja's archaeological collection, which includes ancient Roman tombs, tools, and pottery, but the main sites here are the gorgeous beaches. After a long day in the hot sun, the best place for shopping, relaxing, and a bite to eat is Novalja's center. It's a small area, but walking along the shoreline and enjoying nightly music shows in town make you wish you never have to say goodbye. A planned apartment community 2 kilometers away from Novalja. It has a long beachfront sidewalk ideal for jogging or walking, scenic parks for relax and picnic, and very clean beaches. It's also very quiet so it's ideal for families. An old bay village 3 kilometer away from Novalja. Features a public beach and many private accommodations. The western part of the bay is unpopulated so there are many small beaches accessible only via boat. A beach located 2 kilometers from Novalja. It features three main clubs, Papaya, Aquarious and Calypso. During the day it's a normal beach with many things to do (bungee jumping, jet ski...) The party starts somewhere after 3 PM, with the so called "After beach party", which can include foam and other themed parties. Then, after midnight, it gets out of control. Zrce enjoys high media coverage so it's popular among Croatian celebrities, and many Croatian popular singers open the summer season right there. The clubs host internationally acclaimed DJs, and many electronic and house music events are held there. A beach a bit smaller than Zrce, but more suitable for families. Basically, the two beaches are in the same bay and you can walk from one to another if you don't mind the sharp rocks bordering them. There is also an urban legend about ruins below the sea surface near Caska but no one has ever seen anything yet, although some claim that the top of the lighthouse is still visible when the sea level is low. Besides party, Novalja and its surroundings offer interesting sights. And if you're an outdoors person, you can always rent equipment for hiking, water skiing, wind surfing, scuba diving, and cycling. Visitors can also go bungee jumping and zip-lining or rent a paddle boat, canoe, or Jet Ski. Fresh Island Festival is Europe's number one urban beach festival, held each summer on Croatia's Zrce beach. The festival takes place in its huge, open-air clubs and aboard boats on the clear blue Adriatic Sea. Today, Mediterranean cuisine is generally regarded as one of the healthiest in the world due to the type and quality of the food and the ways they are prepared. The cuisine of Novalja, which is part of this Mediterranean cuisine, will provide a true gastronomic experience. When you visit Novalja, you should not miss visiting one of the many restaurants. From the menus of these tastefully decorated restaurants, it is highly recommended to try one of the famous local specialties such as cheese, lamb, needle macaroni, or curd strudel. You'll also feel the full magic of the Mediterranean cuisine if you opt for seafood. Among the various fish and seafood dishes, top choices include the refreshing fish soup, the Novalja brodit (fish stew), various kinds of salad, risotto and boiled or grilled fish. 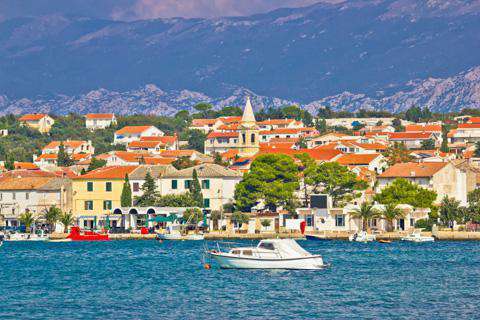 The closest airport is the one in Zadar (Zemunik airport) which is located 85 km away. Since most of the route is country road the travel time is about 1 hour and 30 minutes. The second best airport is the one in Split; this airport is 185 km from Novalja, which equals a driving time of 2 hours and 30 minutes. Travelling directly to Novalja from either airport is only possible by taxi, rental car, or a pre booked transfer. Although most of visitors use a car, you can walk around downtown due to its small and tight streets and a large pedestrian zone. Scooters are also very popular, and the city has many rental services with decent prices. Helmets are mandatory. Public transport consists of three beach shuttles which are actually open minivans that connect downtown, Gajac and Zrce.